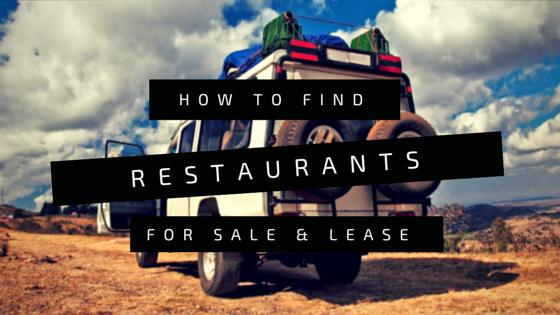 How to Find Restaurants for Sale and Restaurants for Lease. The first decision you need to make is the type of restaurant space you are looking to lease or purchase. There are two choices. Most franchises and national chain restaurants prefer to build-out their prototype store and search for space in shell condition. Many first-time restaurateurs or independent restaurateurs prefer 2ndgeneration space that is currently or formerly built for restaurant use. There are numerous free and paid services that advertise either commercial properties for lease, business opportunities including restaurants and sites specifically advertising restaurants for sale and restaurants for lease. At this time there is no perfect solution. A restaurant real estate broker will specialize and work exclusively with restaurant operators to either buy, sell or lease restaurant properties. A restaurant real estate broker should have in depth knowledge of lease agreements, business sales and acquisitions, parking codes and liquor license regulations. An experienced restaurant real estate broker will have extensive relationships with advisors that specialize in restaurant transactions such as architects, kitchen designers, contractors, liquor license expediters and attorneys. Business brokers typically sell a broad range of businesses. They may or may not have much experience with lease agreements and the many lease issues that can affect a business. There are many business brokers that do not cooperate with other brokers and limit access to their listings to buyers that contact them directly. If you decide to use a business broker to purchase a restaurant or sell a restaurant confirm in writing that they will cooperate and share a commission with brokers from a company other their own. Otherwise you risk seeing a limited number of opportunities or buyers if you are selling. Commercial real estate covers a broad range of property types. Most commercial real estate agent or brokers specialize in a specific type of property or geographical area. For example, office agents specialize in office buildings and retail agents typically lease or sell retail properties and shopping centers. Most commercial real estate agents don’t have experience with business sales or acquisitions. If you plan to use a commercial real estate agent to secure a restaurant for lease, make sure they have some experience with restaurant leasing and are familiar with the specialized needs of restaurant operators. This is the least used method by first-time restaurateurs. Rather than looking for available restaurants for sale and lease, specific properties are selected with the intent to buy the existing restauant from the current tenant or to negotiate a future lease with the landlord when the current lease expires. This can be a very time-consuming process and requires the patience to possibly wait months or years into the future for a specific restaurant site. If you wish to take this approach you will need to research the contact information for the landlord and existing restaurant owner. A restaurant real estate advisor can assist you with researching and contacting the parties involved. In summary the methods above provide the most common ways to lease or buy a restaurant. No matter which options you chose, align yourself with experts that can help you navigate the many minefields of leasing or buying a restaurant. Are you leasing a restaurant or buying an existing restaurant? Download our free report. I am one of those real estate agents (Realtor) who sells houses, land, etc. but have never dabbled in commercial real estate, specifically restaurant. However, I have a client that I don’t want to turn down that specifically ask for me to assist him in finding a restaurant for his needs. He is interested in a Gyro restaurant and location is one of his main concern. I began research on the subject and would like to pull it off and of course have a referral back-up if needed. We have to start somewhere. Any suggestions from your part will be greatly appreciated. You have a few options depending on if he wants to build out a space or lease/buy existing restaurant. I would try loopnet and bizbuysell. Good locations have a lot of traffic, visibility and parking. Hope that helps. If you find a location and need some help let me know. I did not know that there were so many different websites dedicated to the selling of homes and store locations. That seems like a great way to be able to not only find the house or store location that you need but also to compare market prices. I also think that whenever buying or selling a property it is very important to make sure that you have a real estate agent that can help you with all that you need including searching for a location and doing the paperwork. Mark, I can see why you would want to visit a commercial real estate broker when buying a restaurant. I have a friend who has always dreamed of opening his own restaurant. I just hope that he can find a property that would suit his needs. What are the fees and commission for a commercial broker ? Typically on a lease commission is 5-6% of total rent paid first 5 years and 1.5-2% on years 6-10 assuming 10 year lease. this is paid by landlord and split with tenants broker. Typical commission on business sale 10% of sales price. Hi Mark! I need your help I’m looking a comercial space on South Houston. For a COWORKING KITCHEN space , I’m looking some restaurants spaces . You can help me? Send me a direct email and I will try to find someone in Houston to help. Looking open a breakfast house on the big Island looking for lease been in the restaurant business for 40 years. Which part of Big Island? Are you looking for existing 2nd generation space or plan to build out? I don’t work Hawaii but can try to find someone to refer if needed. Mahalo!